Cleaning our dogs’ ears is an important aspect of canine grooming. While it is not expected that you remove debris and particles that may be present in your pooch’s auditory canal on a daily basis, this should, nevertheless, be performed on a regular manner, typically as part of its weekly or even monthly grooming. Dogs can also benefit from daily cleaning of their auditory apparatus if they are suffering from canine ear infections like otitis externa. Cleaning your canine friend’s ears is not really difficult especially if you use any of the 10 best dog ear cleaners that we have listed herein. You can feel safer about the effectiveness and safety of these products to assist your pooch in keeping the integrity of its hearing. Let’s get things clear. 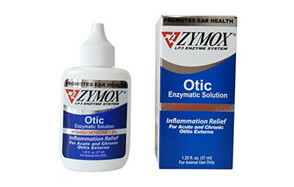 The Zymox Otic Pet Ear Treatment is not an antibacterial solution intended for the management of dog ear infection. However, that doesn’t stop it from killing a variety of bacterial organisms such as Pseudomonas aeruginosa, Escherichia coli, MRSA, Streptococcus species, and Proteus mirabilis. It’s also effective against the fungal specie Candida albicans. Its antimicrobial property is the function of its unique proprietary LP3 enzyme system. We find this as an exceptional feature since enzymes are natural physiologically active substances. If it is true that the LP3 system can kill a variety of organisms, then Zymox is simply the best way to clean ears of our pooches. Do take note that Zymox comes in 2 preparations, one with hydrocortisone and one without. We can only surmise that the hydrocortisone variant is primarily indicated in the reduction of ear inflammation with or without ear infection. 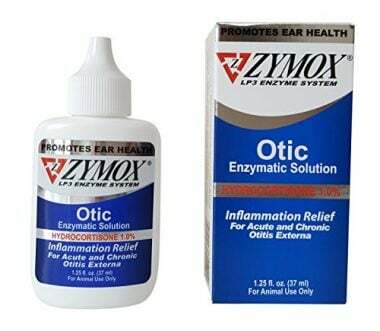 This makes Zymox a great option for cleaning and disinfecting your pooch’s ears especially as an adjunct to dog ear yeast infection treatment. 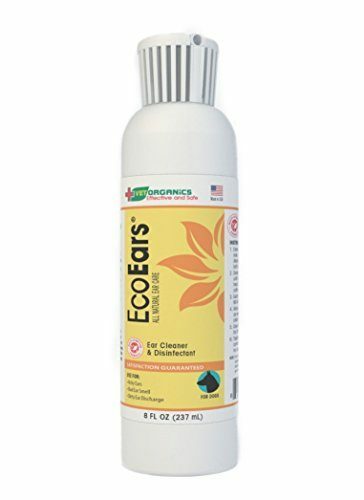 The EcoEars Dog Ear Cleaner Infection Formula is an exceptional pet ear cleaner designed specifically for those who prefer to go the all-natural route. Unlike other products that only contain one or two natural ingredients, Vet Organics’ unique canine ear infection cleaner solution boasts of 5 different natural extracts to help disinfect, sanitize, and deodorize smelly, discharge producing canine ears. 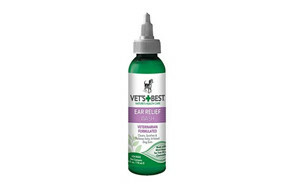 Vet Organics formulated its EcoEars to be used specifically as an adjunct to antibiotic treatment for dog ear infection. The unique combination of ingredients also make it ideal as a safer method of reducing redness and swelling that typically accompanies otic inflammatory processes. It is quite easy to apply, too. Customers who have tried the EcoEars on their pooches rightfully rank it as one of the best ear wash for dogs especially if you’re after something that is safer. Boasting of a unique anti-adhesive property, the Virbac Epi-Optic Advanced Ear Cleaner can be rightfully considered as a great dog ear flush that also serves as a remover of dead skin cells and as an antiseptic solution for canine ear conditions. The anti-adhesive properties, as some customers point out, is important in preventing the adhesion of bacteria and other microorganisms onto the surface of the ear canal, rendering it relatively free from germs. Epi-Optic is especially intended for the management of otitis externa or inflammation of the external ear. Its acidic formulation should readily neutralize any susceptible organisms. Do take note that its principal ingredient is salicylic acid 0.2% with the addition of other chemical binders. It doesn’t have any natural ingredient added into its formulation. Nevertheless, based on the number of positive reviews, we’d say the Virbac Epi-Optic is right on the money when it comes to managing a variety of canine ear conditions. If EcoEars comes with 5 natural ingredients, Vet’s Best’s Ear Relief Wash Cleaner for Dogs is infused with 6 different botanicals that work together to clean, sanitize, and soothe smelly, itchy, greasy, and inflamed canine auditory apparatuses. It is this unique blend of pet-safe natural substances that makes the Vet’s Best an amazing ear wash for dogs. It doesn’t include alcohol so it should be quite comfortable and soothing to use even on pups. 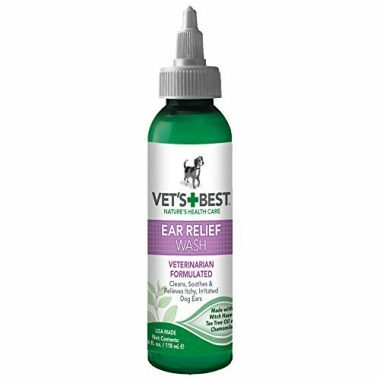 Vet’s Best is primarily intended for cleaning the auditory passages in between baths while making sure that the natural substances present on the surface of the ear canal are maintained for optimum auditory functioning. No wonder it’s slowly climbing its way to the top. Pups and Pounce’s idea of a dog ear cleaning solution is one that doesn’t contain any harmful or irritating substances. 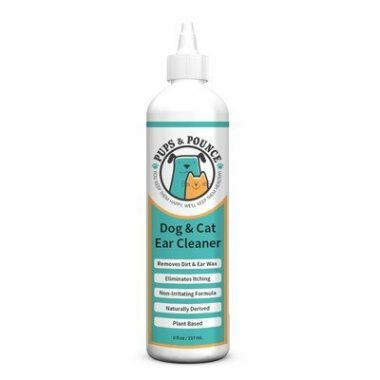 More importantly, however, the pet ear cleaner should also be able to heal and condition the various structures of the external ear while providing instant relief to itching. Pups and Pounce infuses coconut oil and palm oil into their formulation before adding a hint of fresh citrus scent to make your dog’s ears smelling clean in between baths. The antimicrobial properties of coconut oil should also render the Pups and Pounce as a good way to augment existing dog ear yeast infection treatment. 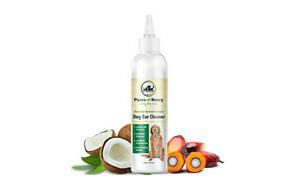 In a formulation that is uncannily similar to the Pups and Pounce product, Paws of Kerry is a great alternative when it comes to augmenting treatment for dog ear infection. It is not an antibiotic, but the antimicrobial properties of coconut oil clearly can help improve the inactivation of microorganisms in the dog’s ear. 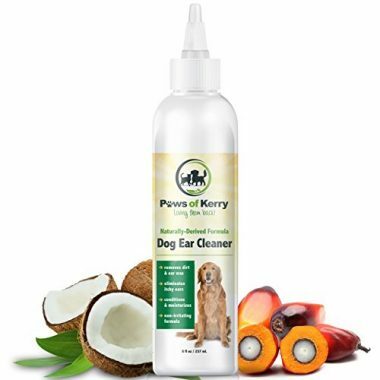 That being said, while Paws of Kerry don’t have the numbers of avid fans that can rival the other products in this list, the strength of the reviews show that it is a very formidable ear wash for dogs. It is safe and very effective when it comes to relieving any symptom or sign associated with canine ear infection or inflammatory processes. The dog ear flush formulation of Top Performance is a medicated preparation designed to both clean and treat auditory passages affected by dog ear infection. It has a rather unusual combination, though – eucalyptus and isopropyl alcohol plus salicylic acid. 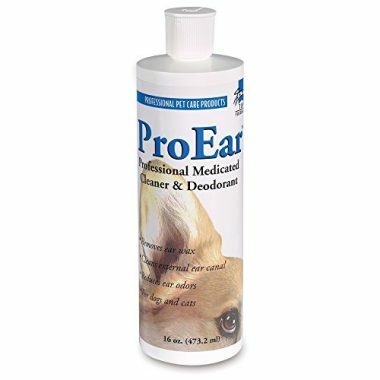 This makes the ProEar Professional Medicated Ear Cleaner a really strong dog ear cleaning solution. Our only concern is that, even at 35% strength, the isopropyl alcohol content may excessively dry the skin of the ears. Nonetheless, the addition of eucalyptus should help soothe the drying effects of alcohol while its salicylic acid content is perfect as an addition to dog ear yeast infection treatment. Most of the time you don’t really need an ear wash for dogs. A simple moistened piece of cotton ball is often enough to cleanse its auditory canal especially if there is no existing dog ear infection. However, a better solution is to use the PetMD Dog Ear Cleaner Wipes that are especially formulated for pooches as young as 12 weeks old. The wet wipes are infused with aloe vera and eucalyptus to provide your pooch with ears that are remarkably clean and smelling fresh, too. It also comes with lactic acid to maintain the natural acidity of the skin of the canine ears. If any, the Pet MD provides a more convenient method of cleaning your pooch’s ears even on a daily basis, although current recommendation is at most twice a week. The PP Pet Aroma Care Ear Wipes is essentially similar to Pet MD in both formulation and intended use. It serves more as a preventative against dog ear infection while giving the ears of your pooch fresher and cleaner smell and look. The only difference between Pet Aroma and Pet MD is that the former is cheaper by a couple of dollars. Both still do a good job at preventing canine ear infection, though. You can say that the PetPost, Pet Aroma, and Pet MD are 3 products of the same purpose and formulation. 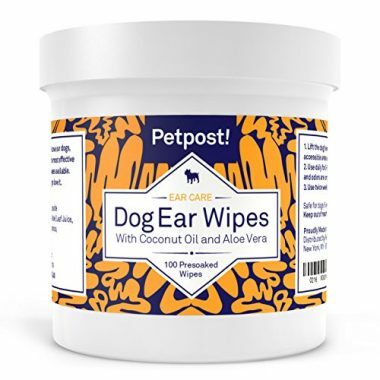 The advantage of Petpost over the 2 wet wipes form of pet ear cleaner is that it is infused with aloe vera and coconut oil. We already know that coconut oil has amazing antimicrobial properties, giving Petpost a better antiseptic profile compared to the other 2 wet wipes in this list. It can also be used as a daily regimen for keeping the ears of your dog free from bacteria and fungi. While it is understandable that Petpost is more expensive than Pet MD and Pet Aroma, there’s another advantage that the two can only dream of. Petpost can actually be used on puppies as young as 6 weeks of age. 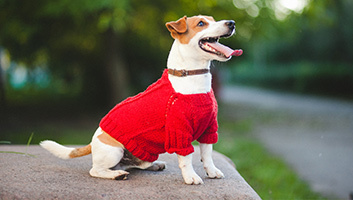 If you are not sure which among these products you would want to purchase for your own dog, worry not as we’ve prepared a detailed and comprehensive guide to help you gain better understanding on what product to choose. First, we’ll take a look at what dog ear cleaners are and why our pooches need to have their ears cleansed. We’ll then look at the different types of otic cleaners and decide which one suits your dog the best. A review of the more common ear problems in dogs should help you better understand the need for cleaning. As the name implies, dog ear cleaners are a type of solution that cleanses the structures of the outer ear of a dog. These are typically infused with some of the most common substances used as either disinfectants or antiseptics or even both. Why Do Dogs Need to Have Their Ears Cleaned? Just like humans or any other living organism, the anatomy of the external ear makes it as an excellent collecting mechanism for dust, debris, and other particles including bacteria, fungi, parasites, and viruses. While it is true that some dogs have naturally drooping auditory panels, thus covering the inner structures of the ear, the mere fact that our canine friends love getting downright dirty whenever they are outdoors simply means that they are also naturally exposed to a host of ear irritants. Of course, this is oversimplifying what is already a very obvious point. Nonetheless, here are two very important reasons why dogs need to have their ears cleaned. You might think that dogs with naturally droopy ears do not have problems since their auditory passages are well-protected from the outside. You’d be surprised to learn that floppy ears are actually more problematic than those with rather short, standing ears. The reason is simple. Because the ear is closed to outside air, heat can be trapped inside leading to condensation. In other words, the relative humidity inside the auditory passages of droopy, floppy ears is greater. And you know what this means. Moisture is one of the key ingredients needed by fungi and other microbial organisms to grow and proliferate. As such, dogs with floppy ears are more prone to the development of bacterial and fungal infections. Cleaning the ears not only removes these microorganisms but also provides a chance for outside air to enter and help ventilate trapped heat inside the auditory passages. Dogs with short ears are still vulnerable to infections, however. You have to understand that the skin has a natural flora of bacteria and other organisms. Normally these don’t make your pooch sick. However, because short ears are generally open to the outside world, these are more vulnerable to cuts and bruises which can provide an access point for microorganisms to enter the inner structures of the ear skin. This can still lead to ear infection. Cleaning the ears can disinfect any cuts or open wounds on the skin so that the bacteria and other germs will not enter the bloodstream. There are two possible reasons why your dog may experience hearing impairment. The first one is due to untreated ear infection. Inflammatory processes that start in the outer ear can spread towards the middle and inner ear where the acoustic apparatus is located. When these very small structures are inflamed or are infected, they loss their ability to convert sound waves into vibrations. This prevents them from transforming vibrations into electrical signals and sending these to the brain. The good news is that cleaning your dog’s ears can help augment antibiotic therapy so that the infection resolves a lot quicker. The second mechanism by which dogs can lose their sense of hearing is through impaction of the auditory canal by cerumen and other waxy debris. Cerumen is a waxy substance that is secreted by the cells of the ear. This is done to help trap debris and other large particles from reaching the inner structures of the ear. Sadly, when allowed to build up to considerable proportions, this waxy substance, together with the trapped debris, can actually harden and block the entrance to the eardrum. When this happens, sound waves do not strike the ear drum and vibrations are not generated to the inner ear. Cleaning your dog’s ears helps remove impacted cerumen, clearing the way to the more efficient transmission of sound waves through the auditory apparatus. Currently there are two types of dog ear cleaners and each one comes with its own set of pros and cons. Let us take a look at these two types. These resemble eye drops except that they are designed to be used on the ears. The idea is to instill a few drops of the solution into the ear canal, leave it on for several seconds, and massage the base of the ear to help distribute the solution throughout the inner structures and to help loosen any debris or particles that may have adhered to the walls of the ear canal. These are the cleaners of choice if you want to really clean the innermost portions of the external ear. The only issue in the use of such an otic cleanser is that it can really be messy especially once your dog begins shaking its head to get rid of the excess fluid still present inside the ear. If you have ever used wet wipes before, then the canine otic wipes are not different. These are typically made of super soft cotton so they don’t scrape against the inner walls of the external ear. These are very easy to use and are definitely not messy. Unfortunately, they only clean the outermost portions of the external ear; unless you have a very small and highly flexible finger that you can use to navigate through the nooks and channels of the canine ear. Liquid vs. Wipes Ear Cleaners: Which is Best for Your Pooch? Based on what we know about the two types of canine otic cleansers, your choice is actually dependent on the condition of your pooch. Since liquid formulations or otic drops reach the inner structures of the outer ear, then these can be exceptionally handy if you want a more deep-seated cleaning of your pooch’s ears. It is also advisable for those with canine ear infections as it has the tendency to loosen up any debris that may aggravate the infection. Given that it deep-cleans, these are perfect for once-weekly applications or even in in-between baths applications. 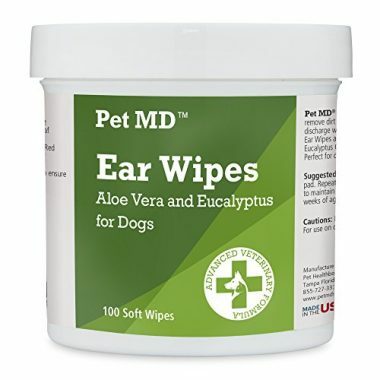 If your pooch doesn’t have any ear infection and you would like to prevent one from occurring, maybe wet otic wipes are sufficient. This is especially true if you have been providing meticulous care for your canine friend that there is decreased likelihood of it getting an ear infection. That said, wet wipes are excellent for everyday cleaning. We now know that dog ear cleaning is very important. In case we haven’t made our case yet, here are some of the more common ear problems in dogs that can be managed with the simple process of cleaning their ears. Every time your pooch heads outdoors there is a chance that it will be exposed to airborne allergens such as dust and pollens. While there are specific medications that can help minimize the severity of allergic reactions brought about by these airborne particles, a simple cleaning of the dog’s ears after a regular bath has been proven quite effective in removing allergens from their ears. Staphylococcal infections are quite common among dogs. We have already discussed how bacterial infections typically develop in the ears of dogs. The good thing is that there are plenty of canine antibiotics that are excellent in killing the bacteria that causes ear infections. There are also otic solutions that come with bactericidal properties such as those that contain enzymes and other natural substances with known antimicrobial action. Fungal infections are quite difficult to treat. These microorganisms are sturdier than bacteria and will typically require a longer period of treatment. These typically occur in dogs with floppy ears because of the high humidity within the auditory canal, favoring the growth and proliferation of such microorganisms. There are antifungal treatments available to manage such infections. Cleaning the ears with an otic solution that comes with antifungal properties also helps. 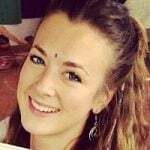 Aerating the ears can also expose the colony of yeasts to oxygen, hastening their demise. This type of ear problem in dogs can really drive your pooch crazy. These ectoparasites most commonly infect cats. However, these can easily migrate to dogs in a multi-pet household, bringing itchy discomfort to your pooch. There are antiparasitic medications that help kills mites as well as fleas and ticks. In addition to these canine medications, using otic drops can help lessen the number of these mites in the ears. There are also some otic drops that are quite exceptional when it comes to killing these pests. Plant debris, small rocks, or any other small particles can get lodged in the ear canal of your dog leading to obstruction and a resultant reduction in hearing acuity. Cleaning your canine pet’s ears can remove debris. Cleaning your dog’s ears is quite easy. Here’s how. Make sure your pooch is calm and well-rested even before you start poking inside its ears. Dogs don’t really take kindness in sticking an object into their ear. Bring your pet to a well-lighted area. If your pooch is quite feisty, enlist the assistance of another person to hold it. 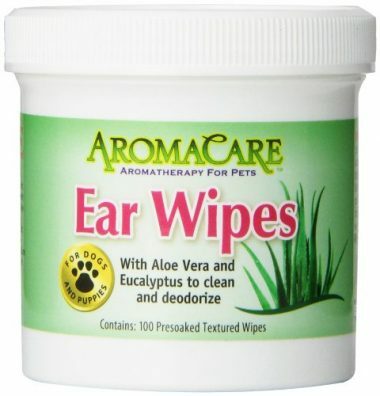 Get your wet otic wipes and meticulously clean the outer portions of your pet’s ear. Work your way from the outside in. Get your otic drops and try to straighten the ear canal of your pooch by pulling on its ears outwards and a little bit to the front. Slowly insert the tip of the otic drop and squirt one or two drops into the ear canal or as recommended by the manufacturer or your veterinarian. Remove the otic drop from the ear. Leave the solution for about 60 to 90 seconds while massaging the outside of the ear at its base. This helps distribute the solution and loosen up any debris. Once the 90 seconds is up, encourage your pooch to shake its head. This removes any remaining fluid from the ear. Get another wet otic wipes and clean the rest of the ear. Don’t forget to praise your pet. Give it hugs and treats right after the cleaning of its ears. Cleansing your dog’s ears is important in preventing infection, managing airborne allergies, reducing mite infestation, and removing foreign body obstruction. Your choice of the best otic cleansers is actually dependent on whether you need a superficial or deep cleaning. Regardless, a combination of both otic drops and wet wipes promises to be an exceptional method of keeping your dog’s ears clean. That is why we included a combination of both types of otic cleansers in our own list of the best dog ear cleaners.